Jeppesen is proud to support the mission of Think Global Flight and their message of fostering STEM (science, technology, engineering and math) education and green technology. For every $1.00 donated to Think Global Flight, the supporter is entered to win one of two packages that include Jeppesen products and services. Recently the 2013 fall giveaway recipients were announced and the 2014 spring giveaway is underway. Currently more than 20,000 students and teachers are participating across the globe in 25 countries and 31 U.S. States. The FAA and Department of Education has recognized this high quality program for providing real world application to learning. 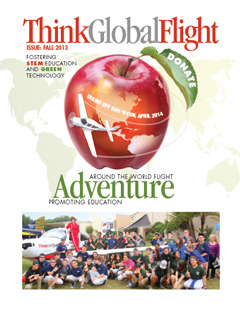 To learn more about Think Global Flight, go to www.thinkglobalflight.org. Posted on December 16, 2013 in Community.